This tutorial explains SQL Environment setup, in order to practice skill commands, database engine is required. Any database engine oracle, MySQL or Microsoft SQL server etc. For example in order to practice SQL commands database engine is required. Any database Engine oracle, MySQL or Microsoft SQL are required. We are going to download and then install MS SQL server. It supports Windows operating environment only. Mine is windows 7 operating system. For this windows 7, old version Express edition that is a free edition from Microsoft. Download MS SQL server for windows 7.32bit. If we use windows 10 then you can use MS SQL server 2016 Xpress edition. This Express edition is free software and it is suitable for practicing SQL Commands, as well as for small size websites. SQL server Express edition is free edition. It is suitable for small scale websites not for large scale websites. Note: 2016 Express edition or 2014 Express edition SQL Commands are common, no difference. If you have windows 7 operating environment download 2014 Express edition. See service requirements are windows 7, windows 10, windows 7 service pack 1, windows 8, windows 8.1 etc. Minimum windows 7 and service pack 1. Now select Express advance 32 bit SQL X86 or 64 bit operating system according to you OS. Mine is 64 bit so I’m downloading this x86. Click Next and it will start downloading. After downloading you can get this file SQL server Express edition, free edition, you can get this executable file. Click this one Run as administrator, actually SQL server RDBMS (Relational Data Base Management System) is commercial software but free edition is also there. 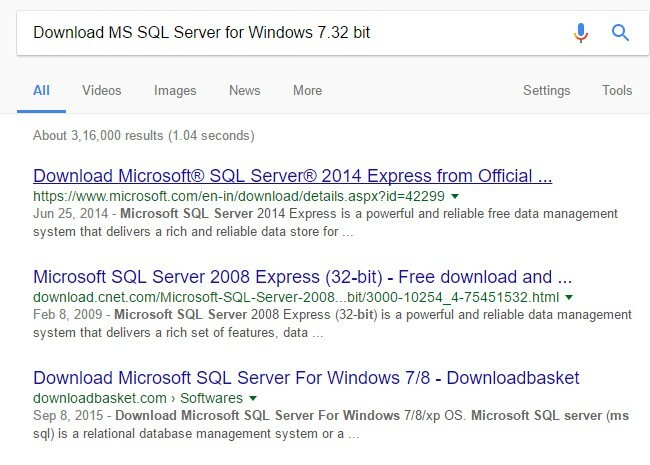 This SQL server Express edition is free edition. Upgrade from old version to this version. I am selecting the 1st one because I don’t have SQL server installation in my machine. Accept the licence agreement. 2nd one is the optional. .
Next launch MS SQL server : All programs -> MS SQL server -> SQL server management studio. If you want to overwrite and execute SQL queries click New query. In this editor you can type queries & execute queries. Execute.